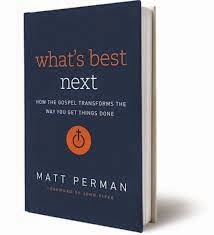 This is the third of three posts on how I've implemented What's Best Next, by Matthew Perman. The first post can be found here. The second post is here. This post is long overdue. I've been busy and, as much as I've wanted to write it, it hasn't been what's best next. 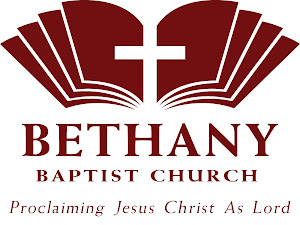 I've also realized how hard it is to quantify the impact of WBN on my ministry both at home and at Bethany Community Church. Even reading over this post again, it doesn't capture everything I'd like it to say. I knew it would be that way and so I've delayed writing the post. But I'm glad it's taken awhile. At a pastors' retreat, I shared some of the things I had learned and implemented from WBN. One of my friends asked a penetrating question that had lurked in the back of my mind and disturbed me to hear articulated: "You've been doing this for 4-5 weeks. Do you really think this can last?" I answered honestly, "I don't know. I sure hope so." I'm writing this post six months after reading WBN and the answer is, so far, yes. Sure, I haven't been faithful to keep up with everything I've wanted to do. Some things I stopped doing for a few weeks then started doing again. But at this point, I think I can say with confidence that most of the changes I have made are going to be long-lasting. Knowing I won't be able to communicate the full impact of WBN, here are a few examples of its impact on my ministry. I'm also taking greater joy in not getting things done. Perman is right in arguing our joy must not come from accomplishing things on a list. Good days for me in the past were defined by accomplishing what I wanted to accomplish. Bad days were days where things were left on the list. I think I'm doing better at defining a good day as one in which I'm faithful to do what God would have me do with joy. My ability to track projects and make progress on various ministry initiatives has increased significantly. The practical suggestions in WBN and GTD (Getting Things Done) are bearing some fun fruit in my ministry (and my home). Initiatives that stalled for months are progressing in God-glorifying ways. For years, I hated emails. They sat and sat in an inbox with little hope of leaving until the project they referenced was completed. And the moment the inbox was emptied, a flood of new emails replaced the crop that had just departed. The process Perman lays out to deal with "stuff" is the single most helpful practical counsel I have ever received for dealing with administrative issues. WBN provided me with a template to help encourage our staff. First, it contained tools I could hand to them to help with areas they might be struggling with in their ministries. For example, if a staff person struggled to stay on top of projects, WBN had some helpful suggestions. Or, if a staff member struggled with how to delegate responsibilities, I could direct them to another chapter from WBN. It's a great coaching tool and, to paraphrase Paul, I could entrust what I'd learned to faithful people who could help others also. It also provided me with a system where I could track my care for them. It's frustrating if a person in an area of leadership forgets a commitment they made to you or fails to do a task essential for you to accomplish your job. An ineffective leader can be a frustrating bottleneck in an organization. Finally, it helped me track how to care for them. Instead of a special need they had becoming a task on a long list that gets lost in the shuffle of paper on my desk, their need became a special project. The project became something my attention was focused onto weekly. That's been helpful. WBN also helped me shepherd my family more effectively. There were so many areas in which I had said, "Someday I really need to think about how to address that issue." Putting all those issues into projects and thinking through the next steps and understanding my need to be faithful to do that which has been most important is going to yield fruit into eternity in my kids' lives. In fact, just this last week, I began to train my children in implementing parts of WBN in their own lives. We're not six months into the process yet, but Whitney has noticed a remarkable improvement in the kids' ability to be faithful in doing what they are supposed to be doing. Pastor Ritch summarized WBN this way: "Go to bed early, then get up at 5 A.M." He was kidding, but not entirely. Much unfaithfulness in my schedule comes from poor decisions made late at night and early in the morning. I fail to get the rest I need and the start on my day that would make it more productive. This is the area I'm still struggling with the most. I know I need to get 7 hours of sleep but that still seems so unattainable. But, by God's grace, I'm getting closer. This process of "getting closer" is a theme for much of what I'm implementing with WBN. I haven't arrived, but the book helped me understand targets for which to shoot and tools to help me aim more effectively. It's not an exaggeration for me to say that no other book impacted the practical side of my ministry more than WBN. I highly commend it to you.